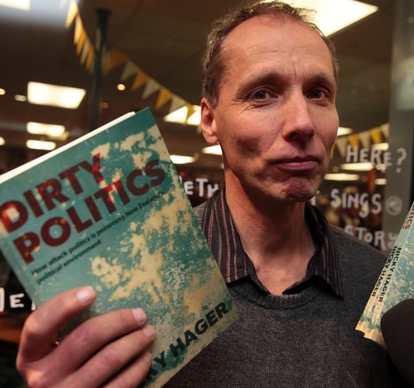 Nicky Hager’s book “Dirty Politics” has captured the headlines since it was released and has rocked this election campaign. At a recent public meeting in Auckland, Nicky Hager engaged with the public answering questions and explaining the ethos behind the book and how he came to write it. Josh O’Sullivan was there. The focus of the book is a two-track approach to winning an election. The idea for the book came from an email conversation Nicky had with Simon Lusk after the publication of his last book The Hollow Men. Lusk wanted to share his thoughts on negative politics. He had been watching how the US Republican Party had been using negative political strategies. In particular, he pointed to the “Willie Horton ad”, an attack ad on 1988 US presidential candidate Michael Dukakis which helped secure the presidency of George Bush Snr. This example of a two-track campaign became a model of how to exploit campaign finance laws and use outside groups to deliver hard-hitting messages on behalf of the candidate. “There are a few basic propositions with negative campaigning that are worth knowing about. It lowers turnout, favours right more than left as the right continue to turn out, and drives away the independents. Voting then becomes more partisan,” Lusk wrote, explaining the Republican Party strategies. Key to this strategy was the development of blogs. Bloggers are not held to the standards of journalism and so can say what they wish – whether it be rumour, fact or fiction, without implicating the party they are associated with. This two-track strategy was adopted by the National Party in its relationship to Cameron Slater and David Farrar and the company they keep. It resulted in a co-ordinated attack on all opposition, be it politicians, public servants or journalists, who then had this dirt either held over them as a form of control or blasted into the public arena. This same attack team also received money for what they called PR hits, where large corporations paid Slater to smear and target their opposition – including science lecturers and academia. If The Hollow Men was about how you win over people, convincing voters to agree with you against their best interests, Dirty Politics is about how negative politics disenfranchises voters by encouraging apathy and reinforcing right-wing control. Hager stated that this was what the book was targeting and that the antidote was more public participation in politics, and encouraging even more people to vote. But of course we need to go further than just voting and getting more people into the political sphere. It’s a start, sure, but we need to organise in our workplaces and communities to create alternative systems to challenge the toxicity of compromise and dirty politics found in parliament, because the ultimate breeding ground for these corrupt politics is the hypocritical half-truth of Parliament, where “all New Zealanders” exercise an equal right to vote – and end up somehow with a system of massive and worsening inequality. This is not to say we should accept dirty politics as normal on both the right and left, as John Key has struggled to suggest. National, like Tories everywhere, get their support by appealing to the status quo, while simultaneously invoking fear and disgust – of terrorism, gays, criminals, “darkies” etc. Dirty politics comes naturally to the conservative mindset, obsessed with order and purity. On the left, cynicism, not filth, is the acid that corrodes political commitment. Labour appeals to the “better angels of our nature”, our desire for social equality and practical solutions to life’s problems, but Labour MPs know full well an honest attempt at ending inequality would be met with a firestorm of fury from business leaders, landlords, farmers, and their media mouthpieces. Their promises are cynically made, intended to wake the “great unwashed” long enough to vote before lulling us back to sleep. And this limited democracy, in the absence of mass struggles and workers’ strikes, has been startlingly effective – John Key has overseen a criminal regime with barely a peep from the slumbering masses. Thank heavens for Nicky Hager, who has stayed awake and kept notes for the day when the awakened working class can settle accounts with these thieves in the night.